Background: Existing meta-analyses on the diagnostic test accuracy of depression screening tools have treated both clinician-administered semi-structured diagnostic interviews and lay-administered fully structured interviews as equivalent gold standards for assessing major depressive disorder (MDD) and combined accuracy results across interview types without adjustment. Fully structured interviews do not involve clinical judgement and are considered potentially more reliable but less valid than semi-structured interviews. No studies have assessed whether semi- and fully structured interviews differ in the likelihood that MDD will be diagnosed. Objectives: To evaluate the association of interview method with odds of MDD diagnosis, controlling for depressive symptom scores and patient characteristics. Methods: We analysed data collected for an individual patient data meta-analysis of the diagnostic accuracy of the Patient Health Questionnaire-9 (PHQ-9). Binomial Generalised Linear Mixed Models with a logit link were fit (outcome: MDD; predictor: interview method; covariates: PHQ-9 score, patient characteristics, and setting (e.g. primary care, specialty care)). An interaction between interview method and PHQ-9 scores was assessed. Results: 17 158 patients (2,287 MDD cases) from 57 studies were analysed. Compared to other fully structured interviews, the odds of MDD diagnosis were significantly higher for the Mini International Neuropsychiatric Interview (MINI) [OR (95% CI) = 2.10 (1.15, 3.87)]. 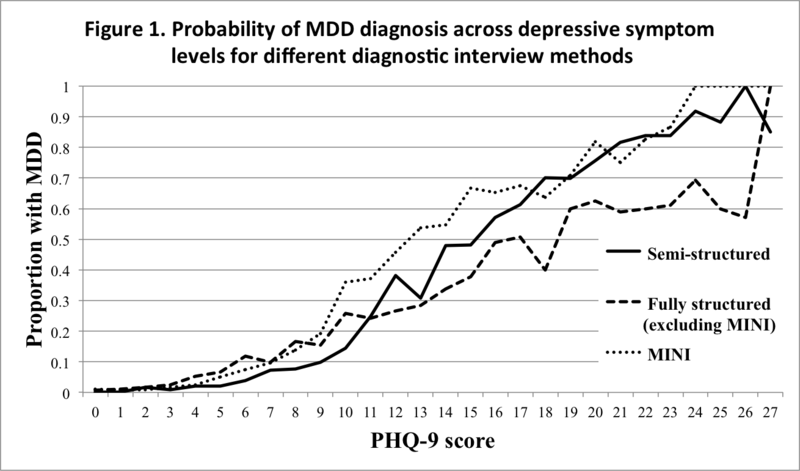 Compared to semi-structured interviews, fully structured interviews (excluding MINI) were more likely to diagnose MDD among patients with low depressive symptom levels (PHQ-9 ≤ 6) [OR (95% CI) = 3.13 (0.98, 10.00)], and less likely to diagnose MDD among patients with high depressive symptom levels (PHQ-9 ≥ 16) [OR (95% CI) = 0.50 (0.26, 0.97)] (Figure 1). Conclusions: The likelihood of MDD diagnosis appears to depend on the diagnostic interview used to assess MDD. Meta-analyses on depression screening tool accuracy should consider methods to account for possible differential verification bias.